Don't Vote! 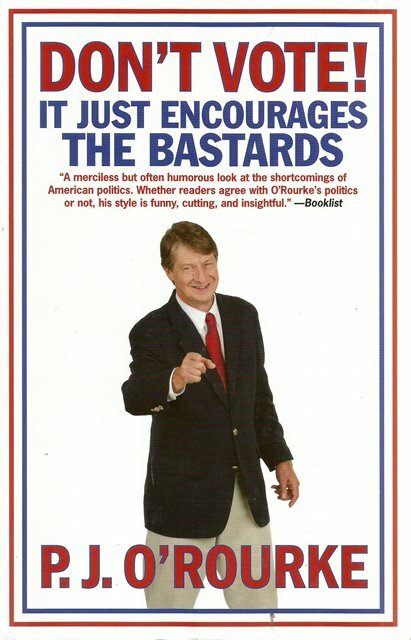 by P J O'Rourke is his latest political masterpiece. 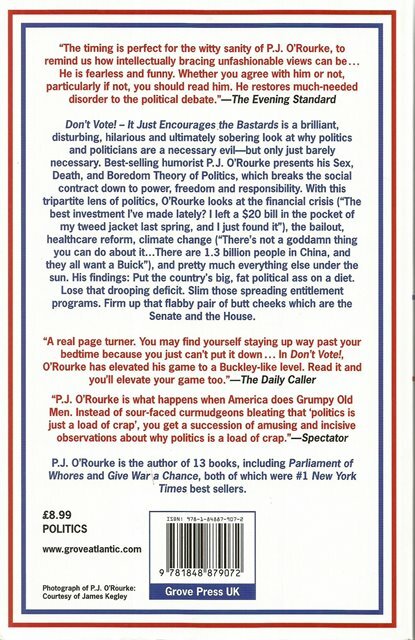 Using his signature wit and keen observational skills, O'Rourke reflects on his forty year career as a political commentator, spanning his addled hippie youth to his current state of right-wing grouch maturity. Proclaiming his political stance as to the right of Rush Limbaugh, O'Rourke explores ideas ranging from why Americans love freedom and the founding fathers' unique perspective on the pursuit of happiness to the modern application of the Bill of Rights, an odd document of which Americans are inordinately proud, that guarantees their rights to Twitter, kvetch, and prevent the Pentagon from sending Marines to sleep on fold-out couches. Far from the typical high school textbook's survey of United States history, DON'T VOTE takes a hysterically sharp look at some of the most important issues Americans face today.